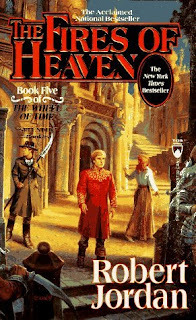 The fifth book in The Wheel of Time opens by picking up the storylines from the previous volume. Rand has convinced several of the Aiel clans to accept him as their chief-of-chiefs, and he makes preperations to lead them back into the Westlands. However, his task is complicated when the Shaido clan rejects him and launches a devastating invasion of the kingdom of Cairhien. Rand is forced to take his troops in pursuit before he can secure the loyalty of the remaining neutral clans, leaving his forces exposed to possible attack on two sides. Meanwhile, Nynaeve, Elayne, Thom and Juilin have extracted themselves from the civil war in Tarabon but now face the task of crossing the hostile nation of Amadicia, the stronghold of the Children of the Light and a country where channelling is outlawed. At the same time, a fanatic claiming to be the 'Prophet of the Dragon' is ravaging the kingdom to the north, Ghealdan. Back in Tar Valon, the Aes Sedai have splintered into opposing factions, with Elaida seizing control of the White Tower and a 'Tower-in-Exile' opposed to her rule establishing itself elsewhere, but the latter's stance towards Rand is unclear. Finally, the Forsaken are preparing a trap to neutralise Rand once and for all. There's certainly a lot going on in The Fires of Heaven and Jordan mostly handles these storylines with aplomb, switching between them to stop things getting stale and delivering a relentless pace to Rand, Mat and Egwene's story, which has them chasing the Shaido hundreds of miles and culminating in the biggest battle in the entire series (to date, anyway). However, the first few cracks in the series' structure are becoming apparent. Given the distances traversed by Rand in his story, Jordan had to find a way of slowing down Elayne and Nynaeve's trip across a much smaller area so events would converge as he needed them to. His solution was to whack them in a very slow-moving circus as it traverses Amadicia, which leads to the first chapters in the entire series so far which don't actually seem to advance plot or character, but merely keep things ticking over for some of the characters. With events proceeding pretty rapidly elsewhere, the cutting-away to Elayne learning to walk a tightrope or Nynaeve being followed around by the lovelorn circus-owner really kills the pace of the book, making it a sluggish read in places. Some readers may also bemoan the lack of any appearance by Perrin in this book. Whilst Jordan had downplayed some characters' appearances in previous novels (Rand in the third, most notably), this is the first time one of the major characters from the first book doesn't appear at all. Jordan makes up for these issues with the ferocious climax. At the end of the book Rand unleashes a blitzkrieg as a huge battle is fought with the Shaido and he has to face down two of the Forsaken in separate, desperate duels with the One Power. During these few chapters an enormous number of important events in the series take place, several important new characters are introduced and no less than five recurring characters are (apparently) killed off. This section of the book really repays careful rereads, as you can see how Jordan impressively set up events ahead of time. In fact, this may be the most dynamic part of the entire series to date and makes for great reading. However, be warned that a fairly big mystery is introduced at the end of Book 5 that has still not been conclusively answered more than 15 years later, although Brandon Sanderson has promised us a definitive answer in the final book of the series. 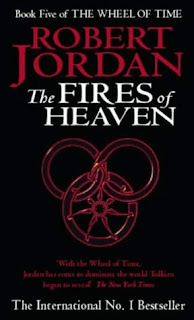 The Fires of Heaven (****) is a solid installment of the series, with a sometimes leaden pace and a very tedious subplot (the circus) more than made up for by the highly impressive climax and the way Jordan deftly spins the series' course onto a new heading (although this also lays the seeds for some extremely dubious writing decisions in the books to come). The book is published by Orbit in the UK and Tor in the USA. Another solid review, and one which does a great job of spotting where and why the series started to come apart at the seams.